I don’t think it is especially nitpickety to wonder what it is about software design for commercial purposes used by media research companies that this little outcome should occur. 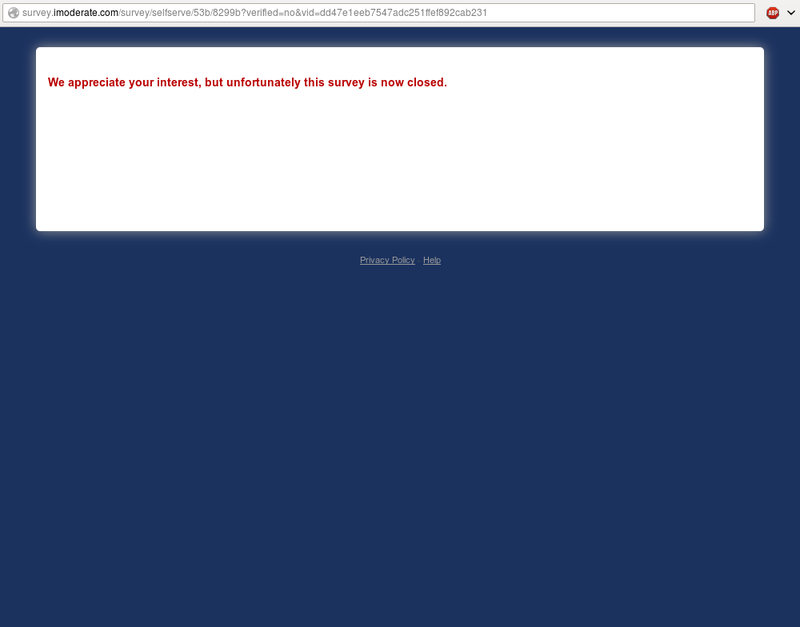 “We appreciate your interest,” they politely tell us, “but unfortunately this survey is now closed”. Just for that, I ought to put iModerate into my popup blocker. After all, I don’t mind the occasional survey request from websites I frequent; nor am I offended that this one launches in a way that evades the popup blocker in the first place. But let us be clear: When N ≥ (sufficient) then stop launching the popup. That is to say, sure, I am not a computer programmer, but I still don’t see what is so difficult about a very basic if/then statement. Instead, when N equals or exceeds the intended sample threshold for the survey, the subroutine simply changes the message to thank the user for their interest in a survey they did not ask to take and most likely would have bypassed, anyway. So, you know … Just stop launching the survey when you have enough responses. Is this really so hard? After all, I will happily concede that it really does seem a strange thing to fret about. Then again, it happened, and I noticed, and then the question persisted. And, still, it persists. It has long been said, “Good enough for government work.” But over the last twenty or so years, what has emerged is a business model that reads, “Good enough for the software industry.” This would seem just a particularly peculiar example of where that idea shows through.